Before getting to the part dealing with the title of this entry, by now you know that I of course have to share my weekly Costco visit with you, so here's some of the goodies I picked up on Saturday morning. 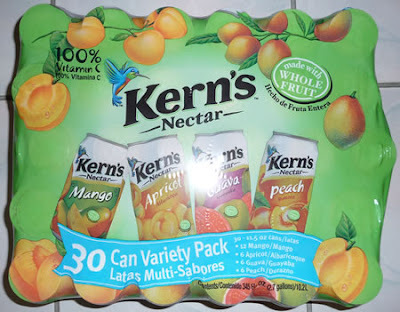 A 30-pack of Kern's Nectar. It's been ages since I've had this stuff. Actually I don't plan on drinking it; I bought it for Julie. I remember back in high school the Nakai twins told us their dad was a VP at the company. 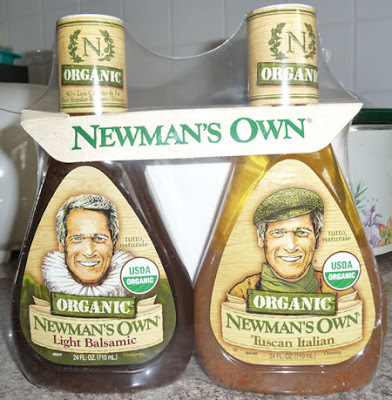 Good stuff..
Newman's dressing. Salad dressing is so expensive - it's a lot cheaper getting it at Costco and better quality, as well. None of that Kraft or Wishbone stuff. Yecch. I thought it was funny that when I pointed the camera at the two bottles, little squares appeared around both faces in the lcd panel viewfinder, identifying them as the human "subjects" of the pictures. 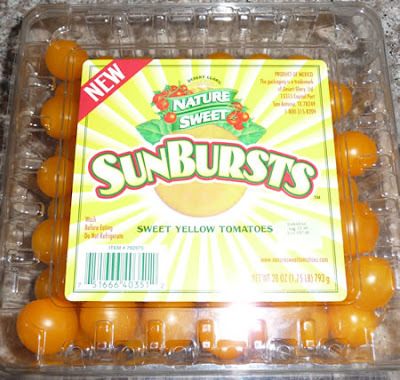 I've never tried these tomatoes but the Campari ones I usually buy didn't look all that red or ripe today so I opted for these. At least they look like they're low maintenance.. just rinse and use! This turkey is pretty good. Gotta replenish my supply for my boring turkey sandwich that I take to work when I'm in the office! The dusting of herbs on this make it more exciting than your average turkey, haha. 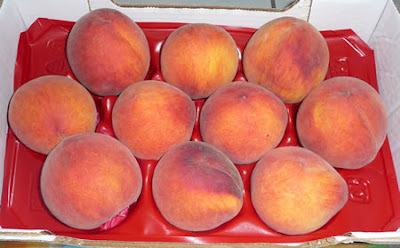 And finally I've included a picture of peaches in here before but these were jumbo. Even the guy checking the receipts at the exit made a comment about how big they were. The last box I bought was ravingly good so I hope these maintain the tradition. 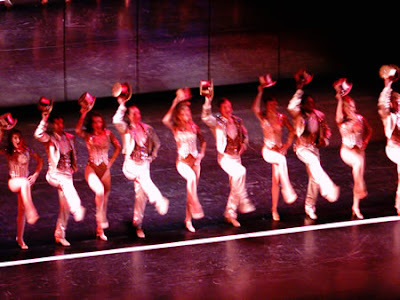 This afternoon we drove down to the Orange County Performing Arts Center to take in a matinee performance of A Chorus Line. I took my binocam (combination binoculars and digital camera) with me and sneaked a few pictures, none of which came out very well. The one below is the least bad among the bad. I never saw the musical when it first came out but did see the movie. Much of today's performance didn't register in my memory from the movie, but I do remember Michael Douglas as the director was much, much better than the person playing the role today. The play itself was okay but didn't excite either Julie or me. There were quite a few empty seats; we asked the usher if it was okay to move closer and she said to be her guest. We moved from the first row of the back section to the last row of the section in front of us, but it made a big difference as far as view. Note: we weren't as close as the above picture would lead you to believe, though. That picture appears closer because it was taken through the binoculars. Weird thing about the binoculars is what you see through the lens is not what the camera sees - the zoom aspect is a lot lower. But still it's better than nothing. Afterwards we walked across the street to the hi-tone South Coast Plaza. What a bunch of ritzy stores! We ate medium-range, at Lawry's Carvery, an informal order at the counter / they bring you your food operation. As you would expect, I took some pictures. 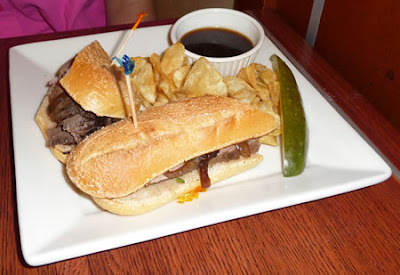 First, Julie's roast beef sandwich. She said it was good and the au jus not too salty. 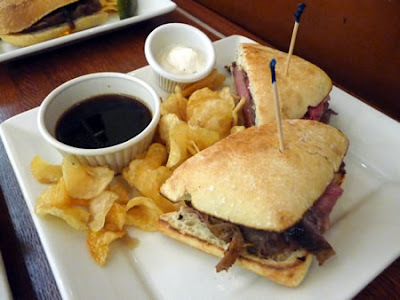 Next, my prime rib sandwich. I ordered it medium and it came out redder than I expected but it was good. 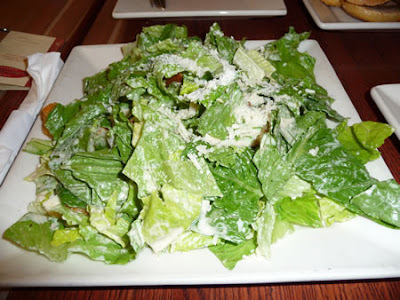 And we shared a caesar salad that was also good. Total tab for this was $32. 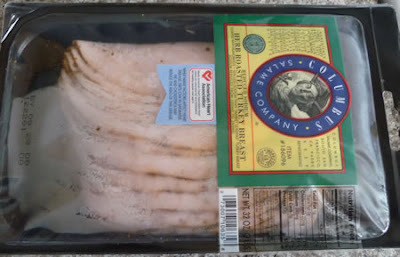 Not cheap, but a lot less than you would pay at the real Lawry's. 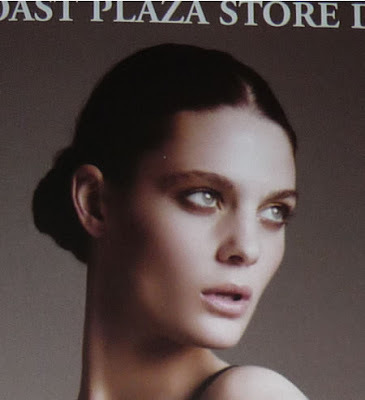 I took a picture of the mall directory because of the scary woman on the cover. Do people really think women are more alluring when they look like Night of the Living Dead, and are angry because of it? Why can't they smile and look friendly? Personally I find the dress attractive but not the woman's expression. Now let's take just her head and remove the expensive dress. Put her on someone else's body in normal clothes and you'd be ready to call 911 because she was having seizures or convulsions from food poisoning and her eyeballs were ready to roll up inside her head. Last thing: I don't want politics to enter this blog but I just have to add my two cybercents here and say I am surprised and happy by John McCain's choice for his running mate. I had no idea who Sarah Palin was before the announcement but she seems like a really down-to-earth, likable person. She even looks like a cross between Sally Field and Diane Keaton. How can you not like that? I was expecting some stodgy, run-of-the-mill establishment person to be named and boy (or girl), am I glad I was wrong. I watched a video of an interview she did with MTV way back on Super Tuesday, long before she had any idea that she would be stealing the thunder from Hillary Clinton (and the Obama campaign as well) nearly seven months later. One thing she said that I really liked was something to the effect of how Americans are getting tired of excessive partisanship that gets in the way of doing the right thing for this country. Amen. I totally agree, and I sure hope whoever wins the election will do something about this. I'm really looking forward to both the presidential and vice-presidential debates; this is shaping up to be the most interesting election we've had in a long, long time. Are we really going to wind up with change for the better, or will it be like Roger Daltrey sang in Won't Get Fooled Again: Meet the new boss, same as the old boss. Okay, that's the soapbox for today. No more politics.